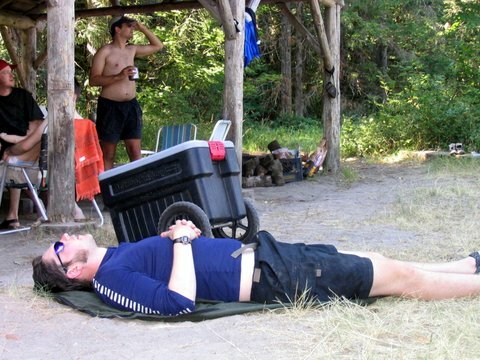 I “invented” my first bike BackPack from an old hiking pack when I was 16. When all my friends were getting their driving licenses, I was learning to bike tour. 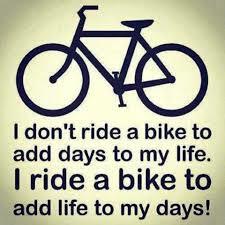 Biking gave me the freedom to go where I wanted-when I wanted. 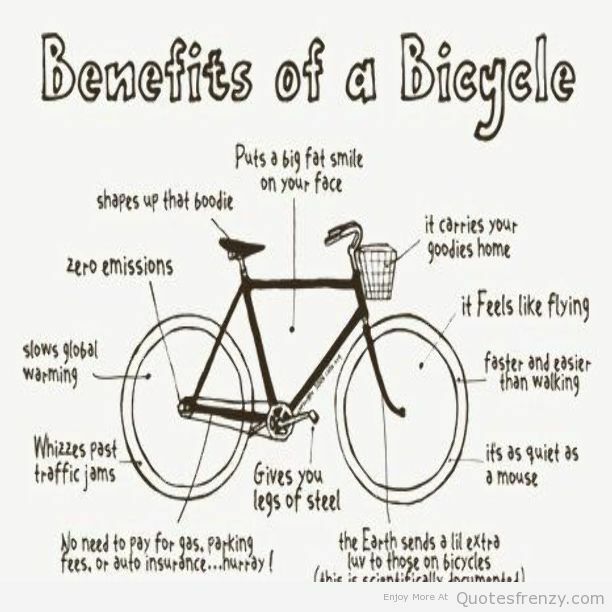 The car keys in my house, came with so many stipulations, biking was a better option. 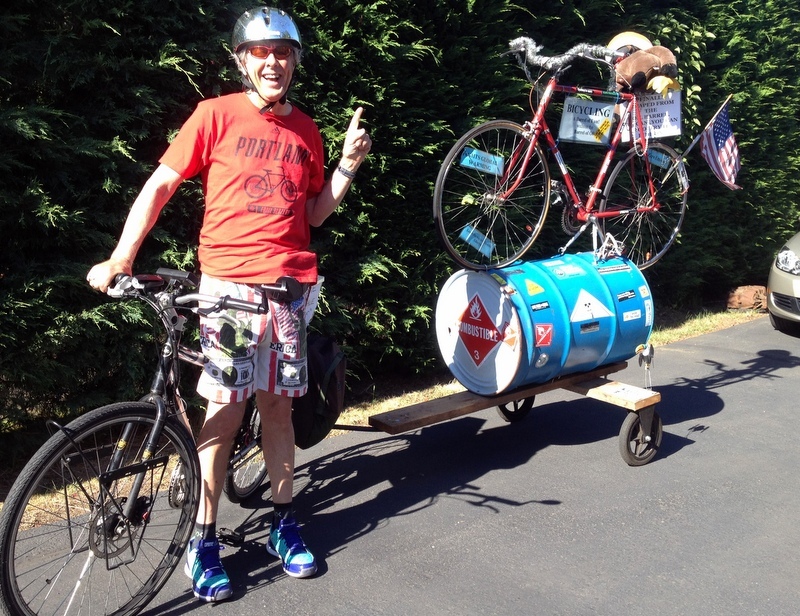 I moved to Portland in 1974 by train and brought my bike with me. It wasn’t much of a bike city back then,.The city hired a full time Bike Program Manger in 1993 and since then bicycling has been given some budget priority. I started a free bike lights program called Get Lit, for which I received a BTA Alice Award. I was also volunteer of the year at the Community Cycling Center. 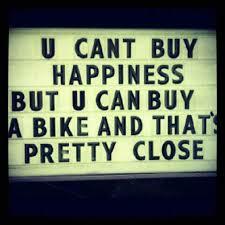 Bicycling has been in my blood for a long time and Portland was the perfect bike city for me. I HAULED IT AROUND WITH MY BIKE AT BIKE EVENTS. 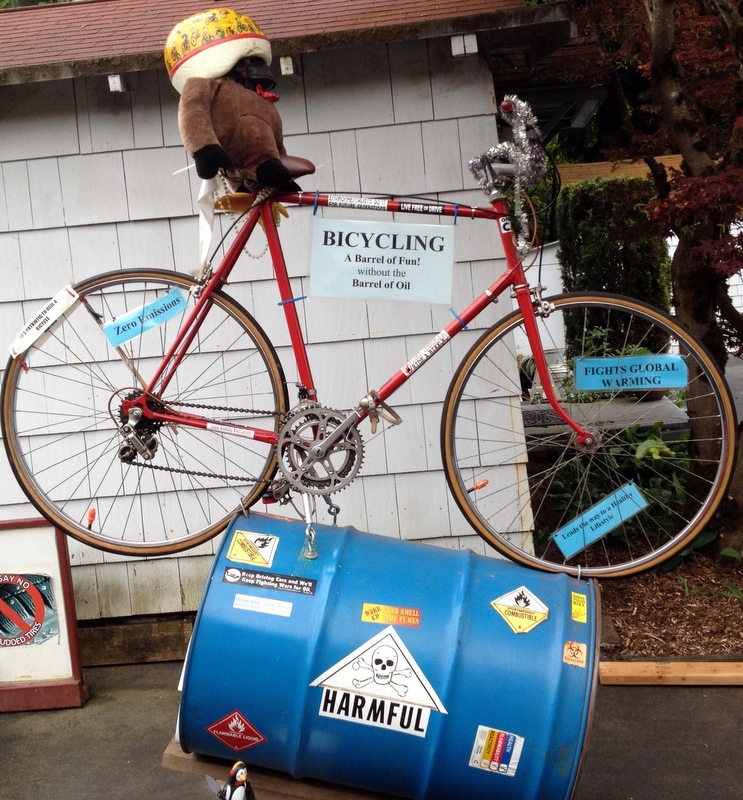 I FOUND SOMEONE TO ADOPT IT AND CARRY ON THE MESSAGE: “BICYCLING IS A BARREL OF FUN WITHOUT A BARREL OF OIL.” BIKING IS GREAT FOR YOUR HEALTH AND THE HEALTH OF THE PLANET TOO. 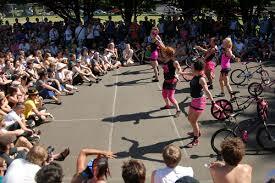 In 2002 Portland hosted “Bike Summer” which helped kick start Portland’s love affair with Bike Fun. 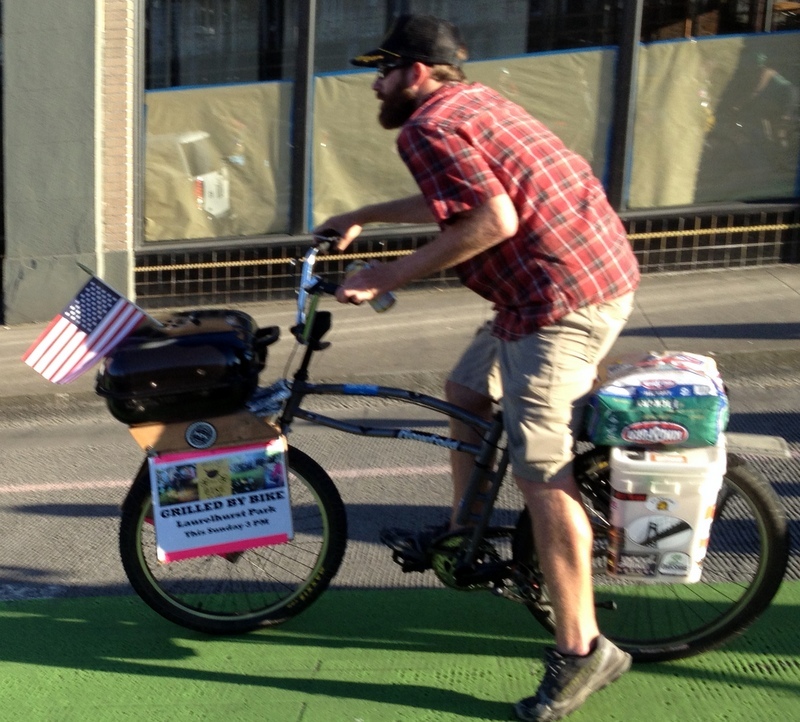 Everyone had so much fun that SHIFT and PEDALPALOOZA were created. 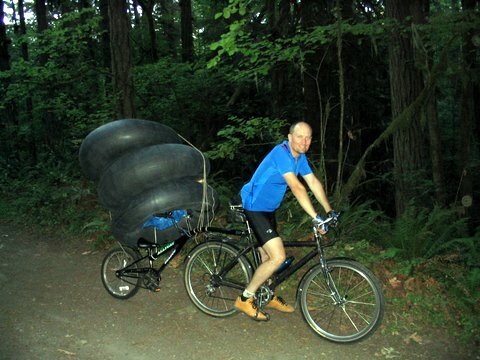 Then in 2005, Jonathan Maus started the “BIKE PORTLAND” website. 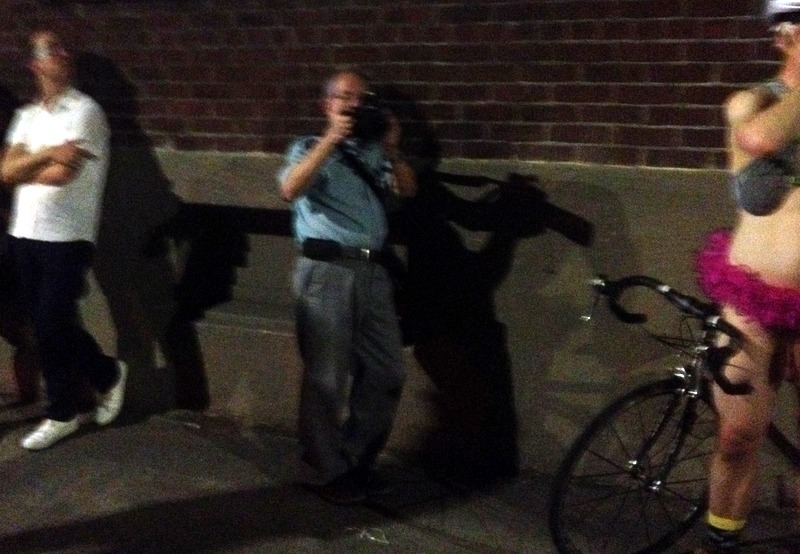 He did a story on the history of what helped Portland to create it’s Bike Culture. 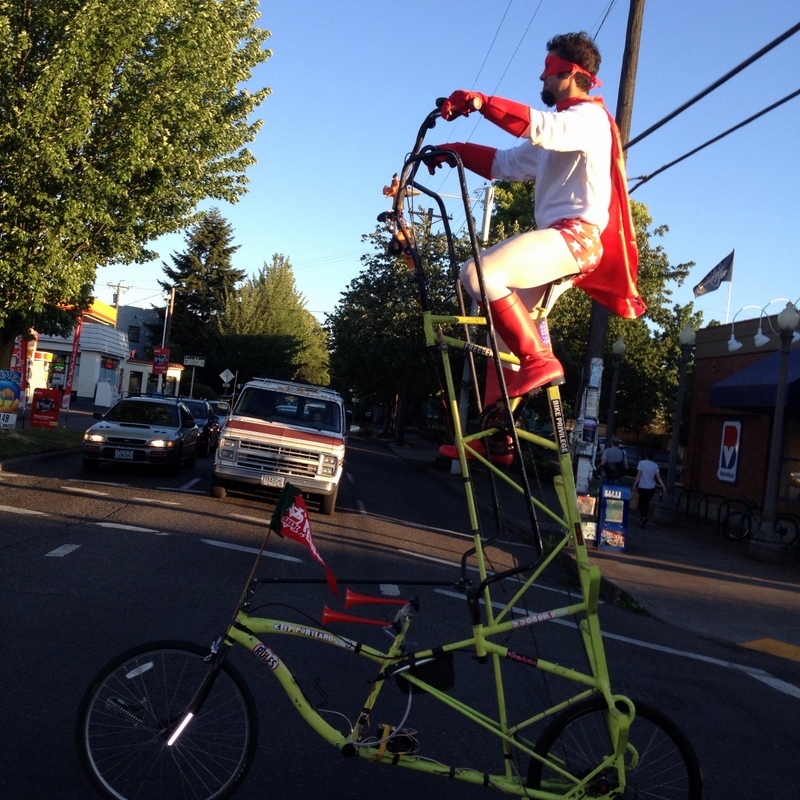 I was lucky enough to be in Portland for this years PedalPalooza bike events. 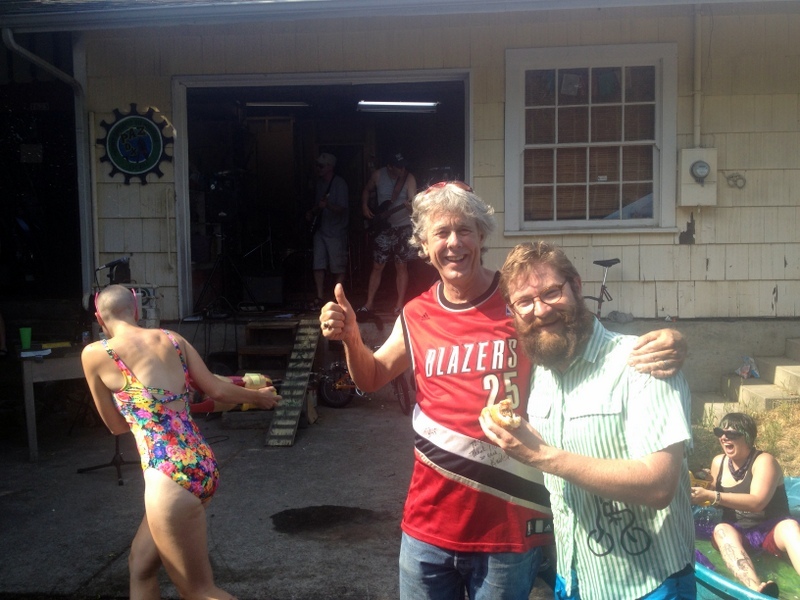 In the past I hosted, Bike to Skate, the Oxbow Campout (an introduction to bike touring) and co-hosted with Jill, The Dandy Warhol’s tour of Portland. 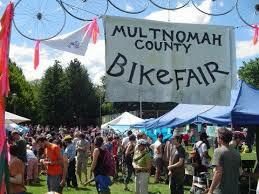 PedalPalooza culminated with the Multnomah County Bike Fair, Which really celebrated Portland’s Culture of BIKE FUN. Some photos ofThe Sprockettes performing before hundreds of spectators. 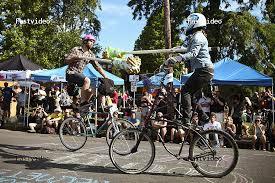 I always thought the bike jousting was a little dangerous, but always a crowd pleaser. 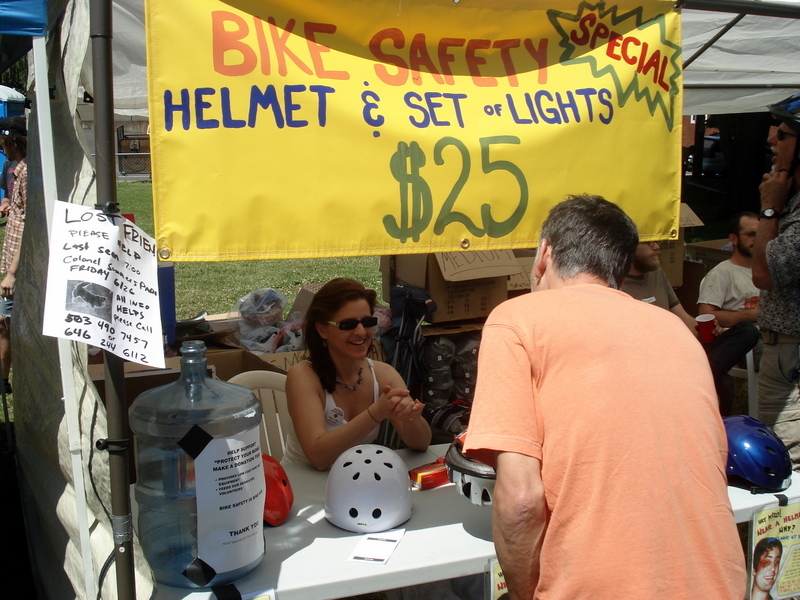 I received a grant to offer low cost helmets and lights and had a booth at the event, promoting what I thought was important-Bike Safety. KIM, PUTTING THE DEALS TOGETHER FOR PEOPLE. 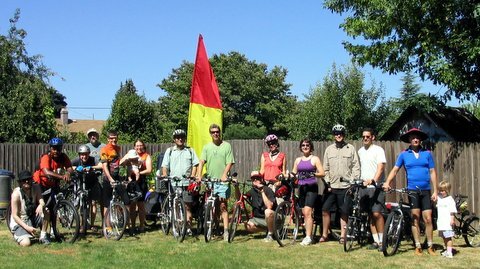 Portland’s best bike event by far is SUNDAY PARKWAYS and I was lucky enough to participate in 2 of them, while in Portland. 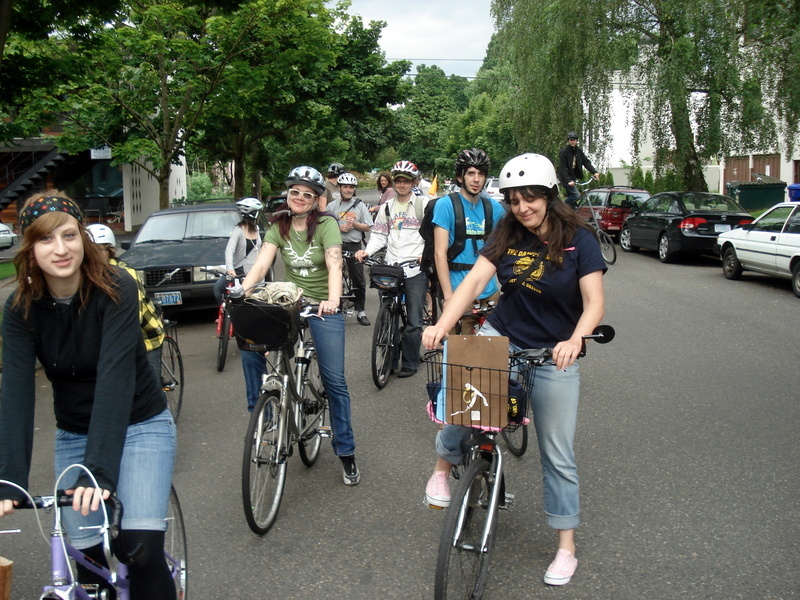 It’s an opportunity to walk, run or bike Portland’s streets without cars. It’s a great event too, because it’s the one event in Portland that doesn’t have beer as the main ingredient., it’s all for the love of walking and biking. 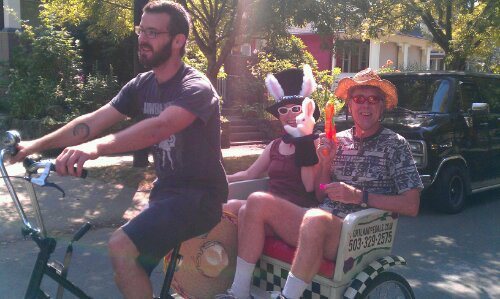 A FEW YEARS AGO BOTH HANMI & I WERE RECOVERING FROM INJURIES AND COULDN’T RIDE, SO WE HIRED PORTLAND PEDICABS TO TAKE US ON SUNDAY PARKWAYS, WITH WATER PISTOLS! 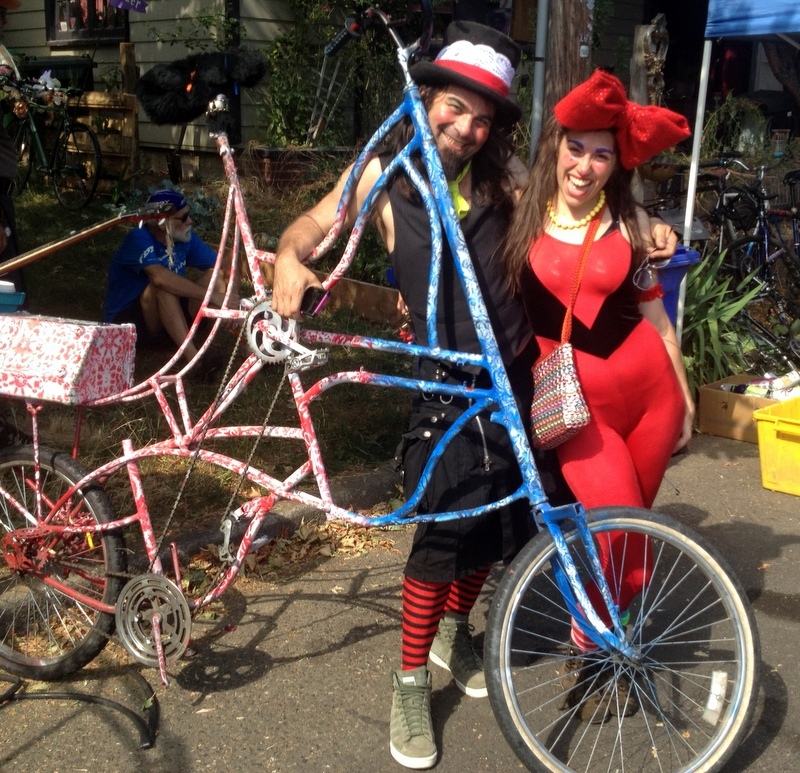 SUNDAY PARKWAYS ALLOWS DIFFERENT BUSINESS’S TO ADVERTISE WHAT THEY DO. 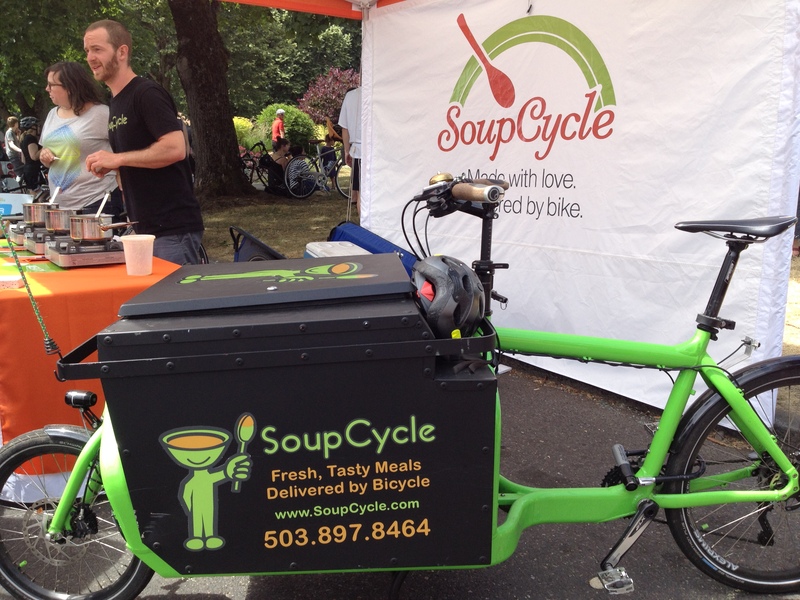 LIKE SOUPCYCLE THAT DELIVERS, BY BIKE, FRESH SOUP TO YOUR HOUSE. 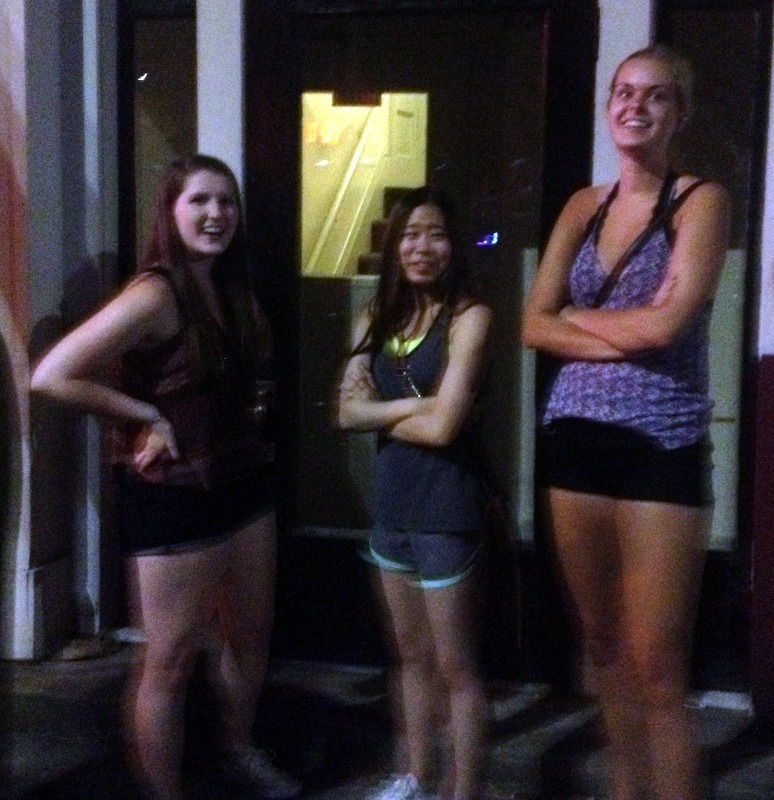 IT’S SO PORTLAND! 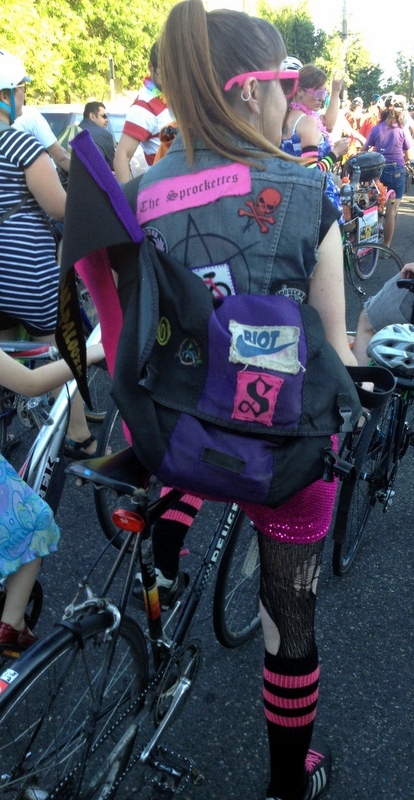 These are some photos from this years Pedalpalooza kick-off ride. 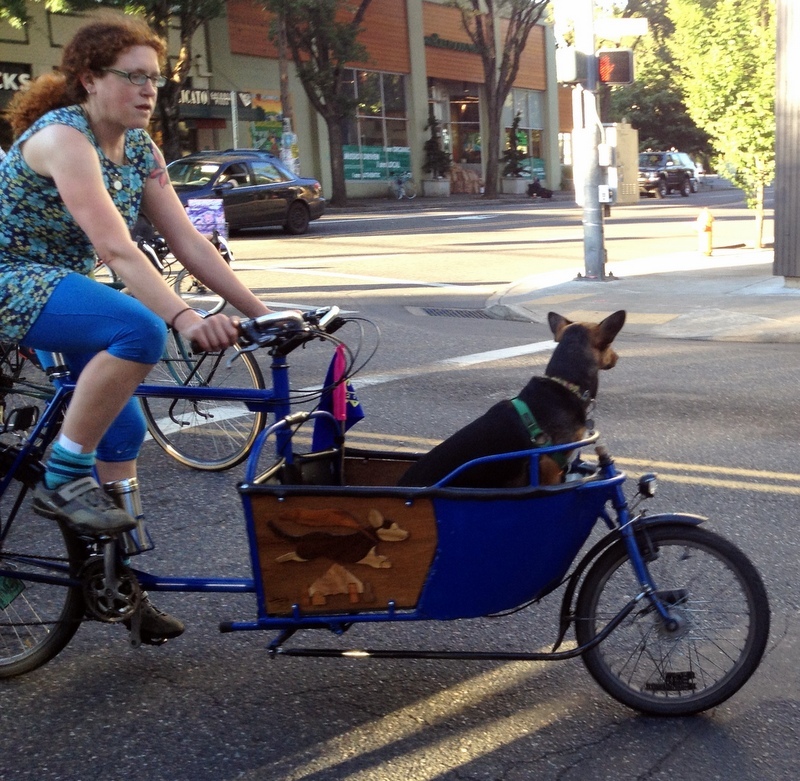 Portland’s bike community wants you to do “everything” by bike. 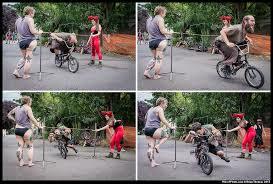 EVERYONE IS INVITED TO A WEEKEND BBQ IN THE PARK WITH “GRILLED BY BIKE” PORTLAND’S CREATIVE NATURE IS SO INSPIRING! 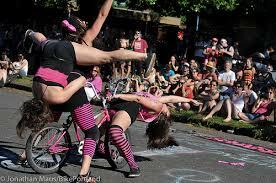 Pedalpaloozaz’s most attended event for riders and spectators is the WORLD NAKED BIKE RIDE. Why ride Naked? The worldwide bike ride highlights the vulnerability of cyclists everywhere and decries society’s dependence on pollution-based transport. It’s also a lot of fun and it’s free for all!. 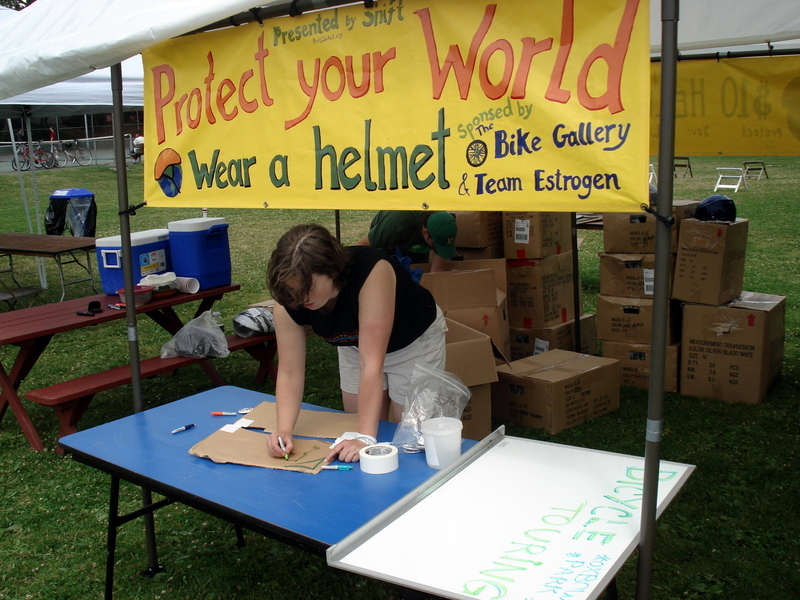 I rode the first WNBR in 2004 and hadn’t ridden one since, Why? I have no idea. But since I’m moving, I thought this would be a great event to participate in. YEP, THAT’S ME WITH ME WITH THE HANDY PHONE CARRIER AROUND MY WAIST. 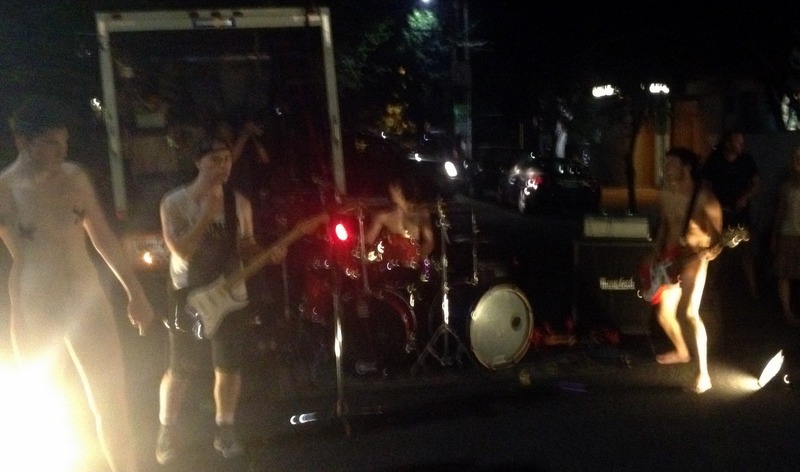 My camera lens was dirty and I didn’t have a T-shirt to clean it, so my photos were poor to bad. 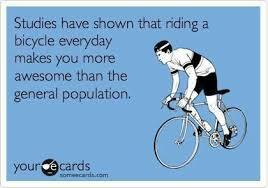 They estimated there were 10,000 riders. 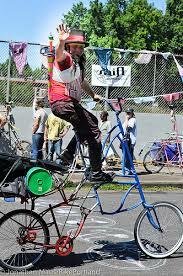 Pealpalozza ends again with the Multnomah County Bike Fair, but it doesn’t quite match the effort from years past. 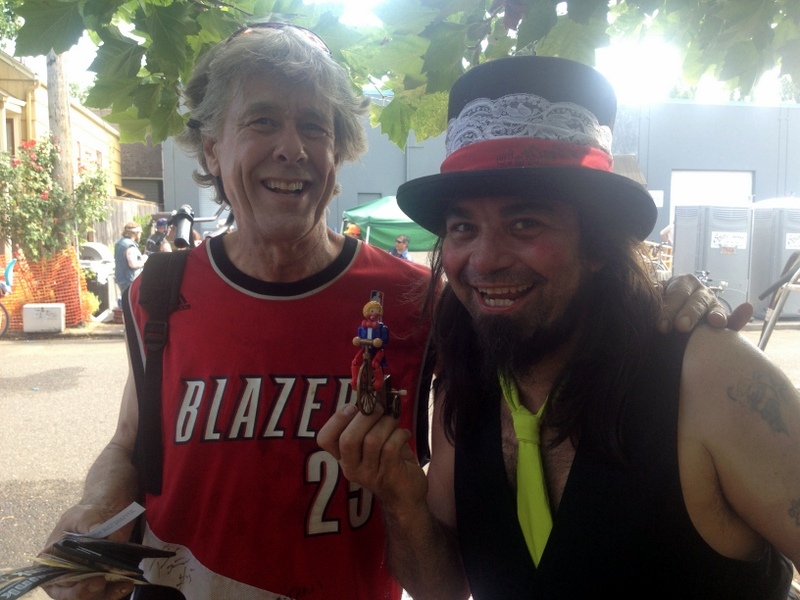 But I had a windup bike toy I’ve wanted to give to Dingo the Clown for 5 years and I thought he would be there. I WAS RIGHT HE WAS THERE AND I FINALLY GAVE DINGO THE TOY. 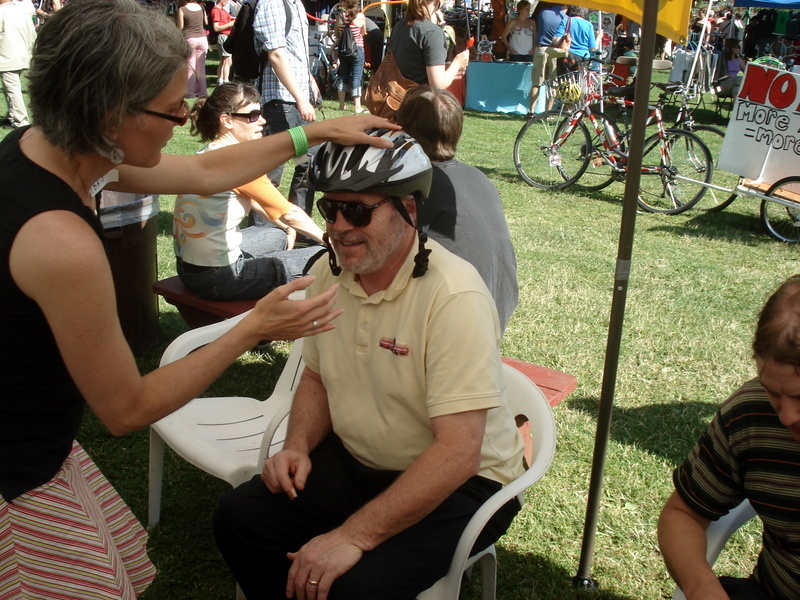 THIS IS DINGO AND OLIVE AT THE MULTNOMAH COUNTY FAIR, HE ATTACHED THE TOY TO HIS HANDLE BARS. MR. RELIABLE, CARL LARSON, AT THE MCBF ALSO ONE OF THE FEW WHO TOOK THE TIME TO COME TO MY PRE-ESTATE SALE, IT MEANT A LOT. I hope you’ve enjoyed reading this blog post as much as I liked writing it. Your feedback and comments are always welcome, I’ve got some readers, but not so many writers. 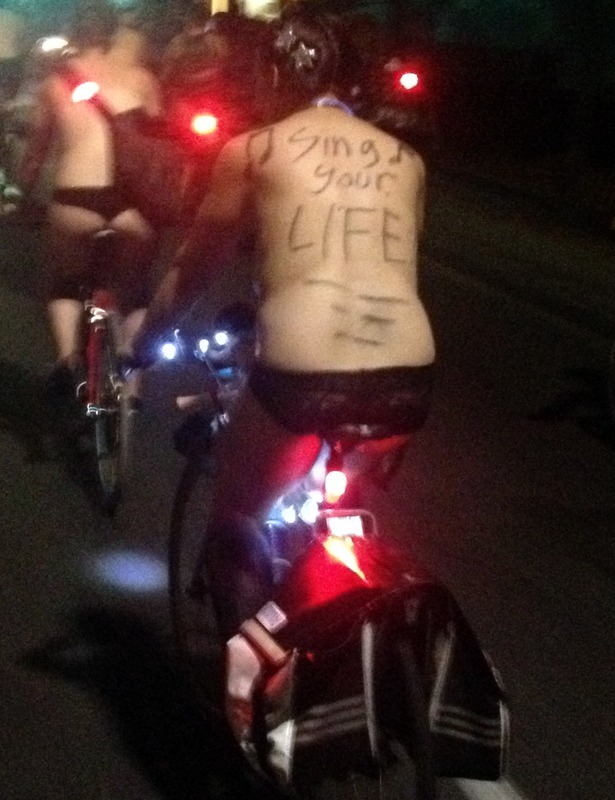 This entry was posted in Uncategorized and tagged bike, OREGON, PORTLAND, WORLD NAKED BIKE RIDE on August 2, 2015 by jeffsbiketour.